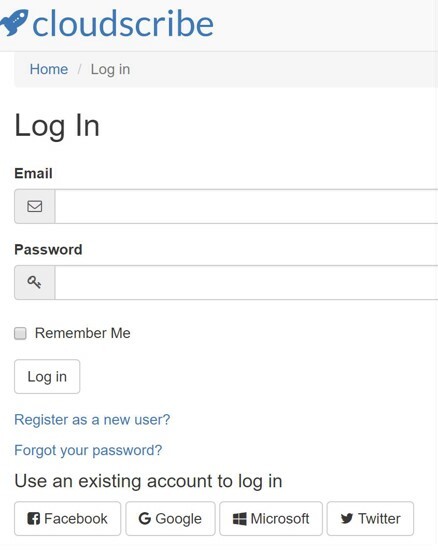 Social Authentication is very useful for sites where you want to allow and encourage user registration. By using trusted external services from providers where users already have an account, users can register and login to your site without having to create yet another password, and this can significantly reduce friction and user resistance to registering on your site. 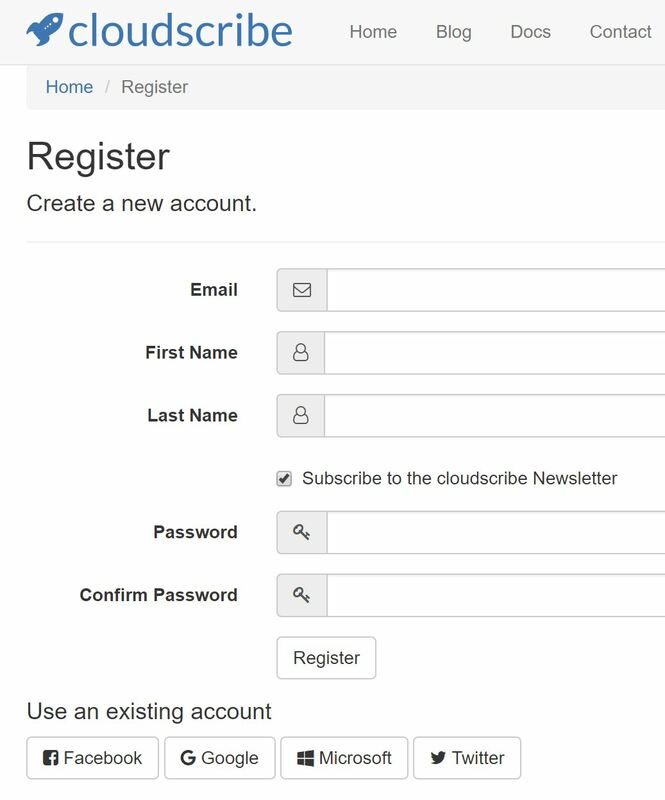 For example here on cloudscribe.com we want to encourage users to register because it gives us a measure of how interested people are in cloudscribe components. So we have multiple social authentication providers enabled, which can be seen on our registration and login pages, as shown in the screenshots below. Users who already have accounts at those services can login to the site using their existing account at one or more of those services. After a user registers, they can still optionally add a local password to their account if they want to from their account settings. Also users who have already registered with a local password can optionally add social logins to their account from their account settings. To get to account settings, users just need to click the welcome message or the avatar/gravatar icon shown in the top navigation area of the page after you login. For Microsoft you need to go to the Application Registration Portal, see also the documentation here for details about how to configure your web application at Microsoft. For Google you need to use the Google API Console, see also the documentation here about how to set things up in google api console. For Facebook, you need to go the Facebook for Developers site, see also the documentation here. For Twitter, you need to go to https://apps.twitter.com/, see also the documentation here. Note that the "documentation" links in the list above go to the Microsoft documentation for setting up social authentication in ASP.NET Core. I linked to those because they give good details about how to setup your credentials at the various providers. 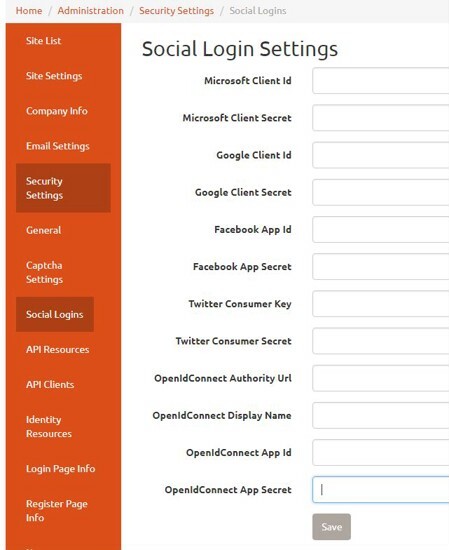 Those articles also show how to wire things up in the Startup.cs file of your application, but you don't need to do any of that with cloudscribe Core, that is already wired up for you, you only need to enter the api credentials in the UI and then the social login buttons will appear on the registration and login pages. OpenId Connect is more open ended, and you can use any service that implements the OpenId Connect protocols. cloudscribe Core has optional integration with IdentityServer4 which implements the OpenId Connect protocols, so you can actually use one installation of cloudscribe that has the IdentityServer4 integration to enable authentication in other installations of cloudscribe Core by setting up the client credentials for IdentityServer4. In other words a cloudscribe Core installation with the IdentityServer4 integration, can be an Identity Provider for other installations of cloudscribe Core or any client applications that can use OpenId Connect authentication. This can be very useful if you have multiple installations of cloudscribe and you want to have the same set of users across installations.